Shodo or Japanese calligraphy is the fine art of using bamboo brush and ink for drawing characters by clearing the mind to create letters in fluid motion. The way in which lines are drawn—whether at the beginning or the end, and direction—is important in creating harmony and balance. Even empty space has meaning. 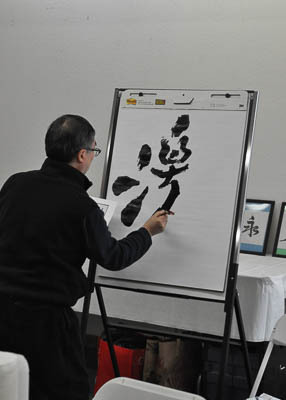 Shoyukai 書友会 will host demonstrations of Kanji, Kana, Hiragana, Katakana, and Sumie (or pictures drawn with sumi, or bamboo soot ink) at the JCCCNC in Classroom 1. Stop by to request a beautiful lettering of your name and favorite word on a fan, Shikishi, or kamaboko board!